Tipton-Haynes Historic Site | John Tipton, Jr.
You are here: Home / Research / History / John Tipton, Jr. It is presumed that Tipton, Jr. moved with his father, mother, and younger brothers as they relocated to Washington County in 1783. On May 28, 1791, he enlisted in a company of East Tennessee militiamen under the command of his older brother Jacob. With a short-lived enlistment, he did not participate with the company during the November 4, 1791 Battle of the Wabash (or commonly known as St. Clair’s Defeat). As the United States expanded westward, a bitter struggle for control of the land ensued between the new country and the diverse Native American tribes. Being the worst defeat suffered by the United States Army to this day, General Arthur St. Clair’s force of roughly 1,000 was surprised and overwhelmed by roughly 1,000 Native Americans in present-day western Ohio. St. Clair’s force suffered a causality rate of over 95 percent, Captain Jacob Tipton being one of the dead. John Tipton, Jr. returned to Shenandoah County and on October 27, 1791, he married Elizabeth Snapp. Being the possible reason for such a brief enlistment in the militia, the couple resided there until the fall of 1797. Elizabeth Snapp was born on November 2, 1771, and died on July 6, 1829. The couple had nine children: two sons and seven daughters. Figure 1. 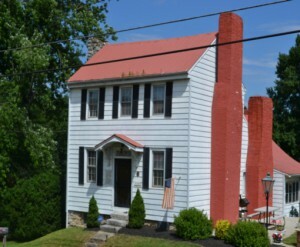 The Blountville home of John Tipton, Jr. as it appears today as a private residence. In the fall of 1797, John, Elizabeth, and two of their children moved from Virginia and settled in Sullivan County, Tennessee. In a newly formed town called Blountville, Tipton, Jr. bought six hundred acres of land for four thousand dollars from his father-in-law, Lawrence Snapp II. On this tract of land, he built a two story hewn log cabin with a hewn log back wing which included four stone chimneys. The logs have since been enclosed in white clapboard siding, while two of the chimneys have been encased with red bricks. Much like his father’s house, the Blountville home also contained a cellar underneath the structure that was used as the kitchen. The Tipton, Jr. home is considered to be the second oldest building still standing in Blountville. From the time of his arrival in Blountville till roughly two years before his death, John Tipton, Jr. was one of the top land owners and sellers of the town. Along with his six hundred acres, he went on to buy roughly four hundred and fifteen more acres of land and two lots for a cost of nearly four thousand dollars. Within those thirty years, though, he sold over one thousand and two hundred acres of land and ten lots for a profit of nearly twenty thousand dollars. On March 17, 1825, he also gave Lawrence Snapp, his brother-in-law, two and a half acres of land for free. The political career of John Tipton, Jr. began in 1803 when he was elected to represent Sullivan County in the 5th Tennessee General Assembly (1803-1805). After completing his two year term and for the next seven consecutive years, he was elected to serve in the 6th, 7th, 8th, and 9th General Assemblies. Unfortunately, little is known about the political career and mind of Tipton, Jr. At the height of his career as a Tennessee legislator, he was elected to serve as the Speaker of the House during the 7th General Assembly (1807-1809). After a brief hiatus, he was elected to represent Sullivan and Hawkins Counties in the senate of the 12th General Assembly (1817-1819). In 1813, Colonel John Tipton died and was buried in a small family cemetery on his property. Consequently, John Tipton, Jr. inherited his father’s cabin and property. The year he moved from Blountville to his father’s cabin is unknown, but by the end of 1820, he had sold nearly all of the land he owned in Sullivan County. The story and a half cabin must have seemed small for the Tipton family since most, if not all, of the nine children accompanied their parents on the move. Sometime in the 1820s, he expanded his father’s cabin to a two story, Federal-style farmhouse. As did his father, John Tipton, Jr. owned and sold slaves. The exact number of slaves owned and sold may never be known. From the Washington County records of slave bills of sale, he sold a thirty year old woman and her two children for a hundred and fifty dollars on July 21, 1828 and later that year, he sold a seven year old girl for one hundred and seventy five dollars. On May 25, 1829, he gave a three month old, female child to his daughter Elizabeth. Figure 2. 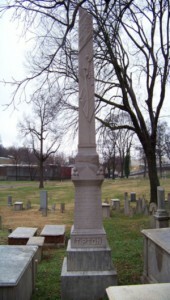 The grave of John Tipton, Jr. and the headstone that was erected by the 49th Tennessee General Assembly. In 1831, John Tipton, Jr. was elected to represent Washington County for the 19th Tennessee General Assembly. At the time of his arrival in Nashville, his health was in a deplorable state. On October 8, 1831, he succumbed to his illness and died. His body was buried in what is now the Old City Cemetery of Nashville. Representatives, senators, city officials, and crowds of citizens filled the streets and graveside as his body was laid to rest. For thirty days the assembly wore a black crape around their left arm to pay tribute and respect for their deceased colleague. The simple headstone of Tipton, Jr. had eroded and even broken apart by the late 1800s. In 1895, the 49th Tennessee General Assembly passed a resolution for the sum of three hundred dollars or more in purchasing and erecting a new and more prominent headstone. Nearly a year after his death, the personal belongings of John Tipton, Jr. were sold at auction. Ordinary items such as a corner cupboard, dishes, tables, a butter churn, beds, pigs, sheep, and much more were sold. Many of these items were bought by his children. One of the highest paid items and the most interesting on the list was a windmill sold for eight dollars and twelve and a half cents. The type of windmill sold or its possible use is still a mystery. In his will, Tipton, Jr. divided his 200 acre farm between his three children Samuel, Elizabeth, and Edna. Samuel, his second oldest son, inherited the house. Slave bills of sale from northeast Tennessee, Tipton-Haynes Historic Site Civil War Exhibit Collection, Tipton-Haynes State Historic Site, Johnson City, Tennessee. Slave bill of sale from northeast Tennessee. Tipton-Haynes Historic Site Civil War Exhibit Collection. Tipton-Haynes State Historic Site, Johnson City, Tennessee. Tipton, Charles D. Tipton: The First Five American Generations. Baltimore: Gateway Press, Inc., 1998. Tipton family: Tipton VI (John Tipton Jr. – including some Snapp data; Evelyn Thompson) (1974-1990 and undated). William G. Cooper Collection. Tipton-Haynes State Historic Site, Johnson City, Tennessee. Tipton, John Jr., Col., 1832 and undated. Tipton Family Collection. Tipton-Haynes State Historic Site, Johnson City, Tennessee.